The Ku Klux Klan (KKK) stands as one of the most infamous secret societies in American history. The white robes and pointed masks symbolize prejudice, terror, and fear to Americans nationwide. 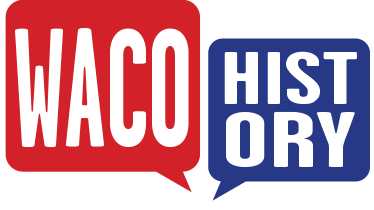 Waco itself, and the greater McLennan County area, served as a hotbed of Klan activity at various times over the last century. The KKK was founded in Tennessee in 1866, but by 1868, Texas had multiple Klan chapters all loosely organized under the statewide leadership of Roger Q. Mills. As Reconstruction played out across the state, their goal was the preservation of white supremacy and white-Democrat control of the government. This first wave of Klan presence stayed mostly relegated to North and East Texas, with Klansmen wreaking havoc on communities by burning homes and fields, beating and killing African Americans, and terrorizing politicians and community leaders until its dissolution in 1871. No evidence exists of a Waco KKK chapter in the late nineteenth century, but the KKK’s official arrival in Waco came with the reconstituted Klan of the twentieth century. At the beginning of the century, resentment toward “foreign” peoples in America such as Catholics, Jews, and African Americans grew as World War I fostered white-nativist and isolationist sentiments across the country. Popular movies such as The Birth of a Nation then further normalized the existence of the Klan and its racial ideology. This led to the reorganization of the KKK in 1915 by the son of a Reconstruction-era Klansman, William J. Simmons, in Georgia. The reconstituted Klan spread like wildfire across the country, including new klaverns in every corner of Texas by the early 1920s. Though the exact date of the chapter's founding is unknown, Erwin J. Clark soon emerged as the leader of Waco's Saxet Klan Number 33 around 1921. He served as the Great Titan of the Waco Province and attorney for the Realm of Texas. Under his leadership, the Waco Klan set out policing the town and surveilling “immoral individuals,” sometimes even chasing them out of town with threats of tar and feathering. At least one man, Kennedy Cummings, actually fell victim to tar and feathering in 1921 after he did not heed a warning from the Klan to leave Waco. Outside of these extralegal measures, the Waco Klan allied itself with local law enforcement, even helping pay bounties for fugitives. The Waco Klavern also set about recruiting Protestant pastors, thereby legitimizing Klan presence through religious associations and strong fundamentalist rhetoric. Klansmen often paraded into local churches, offered the preacher free membership and a “Kludd”—or chaplain—position, and made a donation in front of the entire congregation. The Waco Klan was known to even give pastors up to one hundred dollars, a sizable sum in the early 1920s. The pastor usually accepted and then preached a pro-Klan sermon about preserving the moral integrity of the nation, though some like First Baptist pastor Joseph Dawson refused to join or associate with the Klan. The Klan would also make appearances at community church events, such as the 1921 Clay Street Methodist Church’s Christmas celebration, where they passed out free gifts and treats. 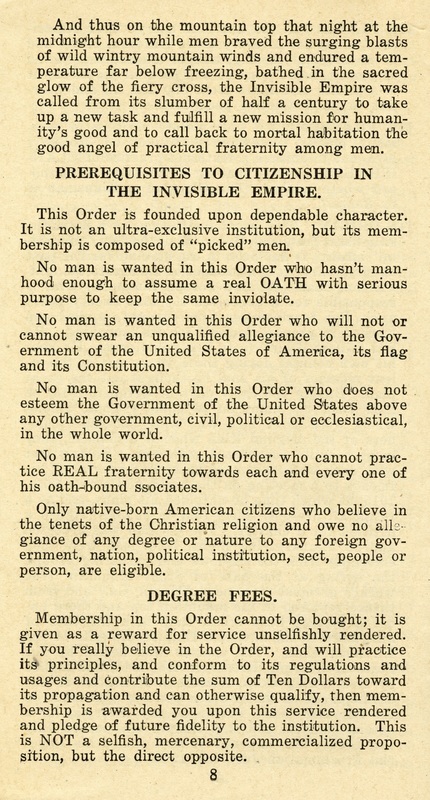 These actions functioned as an effective recruitment technique, as the 1921 initiation ceremony inducted 937 men, with another 210 turned away because the building was full. With its numbers continuing to swell, the Klan soon had a tight hold on the Waco community. It controlled commerce by declaring that Klansmen were required to shop at Klan-owned stores and also to harass businesses owned by Catholics and Jews. To make these distinctions clear, a white card with black bars was displayed in the windows of Klan-friendly businesses around town. An incident known as the Lorena Riot further bolstered the Klan’s influence and hampered that of official law enforcement. After a successful parade in Mart, the Klavern looked to march in Lorena on October 1, 1921. Four thousand residents of Waco and Lorena turned out to watch the spectacle. McLennan County Sheriff Bob Buchanan approached the parade and asked the leaders to identify themselves. The leaders, as with any Klansmen, refused to reveal their identities. Lorena locals tried to reason with the sheriff, but he refused to let the parade continue. At 9:30 p.m. the parade began regardless, with Klansmen marching two by two, led by a burning cross and an American flag. Sheriff Buchanan tried to pull the mask off of one Klansman and suddenly a shot rang out. Then multiple shots were heard and Sheriff Buchanan armed himself with a knife. In the scuffle of guns and knives, Buchanan suffered a gunshot wound to his right arm, five men were stabbed, and one other was shot in the neck. One of the stabbing victims, Louis Crow, later died of his wound. The community quickly backed the Klan and demanded legal action against the sheriff, known to be the man who stabbed Crow. Judge Richard Munroe called upon the McLennan County grand jury to investigate, and it indicted Buchanan for Crow’s murder. The next McLennan County election in 1922 then witnessed the victory of the “Ku Klux Klan ticket,” for positions such as county sheriff and county attorney. By the next year the Klan was bold enough to parade two thousand members through town. The riot strengthened the Klan’s hold on Waco public opinion, and as a result Waco politics as well. The KKK then set its sights on higher political office: the state senate. In what was known as the “Waco Agreement,” four Grand Titans met in Waco at the Raleigh Hotel to decide which senate candidate the Klan would support. Three different Klansmen were in the running at the time, so it was not a straightforward decision. They decided to let the Klan choose by declaring an open race with the understanding that the trailing Klansmen would drop out when the time came. One of the candidates, Wacoan Robert Henry, ran openly as a Klansman, showing the legitimacy of the KKK at the state and national level. Klan officials ended up reneging the Waco Agreement and supporting Earle Mayfield, who did not run openly as a Klansman, over Henry and the third candidate Sterling Strong because of his ties to big business. Mayfield went on to win the Democratic primary. But the agreement and Henry’s candidacy show the extent to which Waco was a center for Klan authority. Yet the KKK’s day in the sun left as quickly as it arrived. Klansman Felix D. Robertson decided to run for governor against Miriam “Ma” Ferguson in 1924. Though not running openly as a Klansman, Robertson had long alluded to his membership by his public defense of the organization. His first campaign stop was Waco in February 1924. 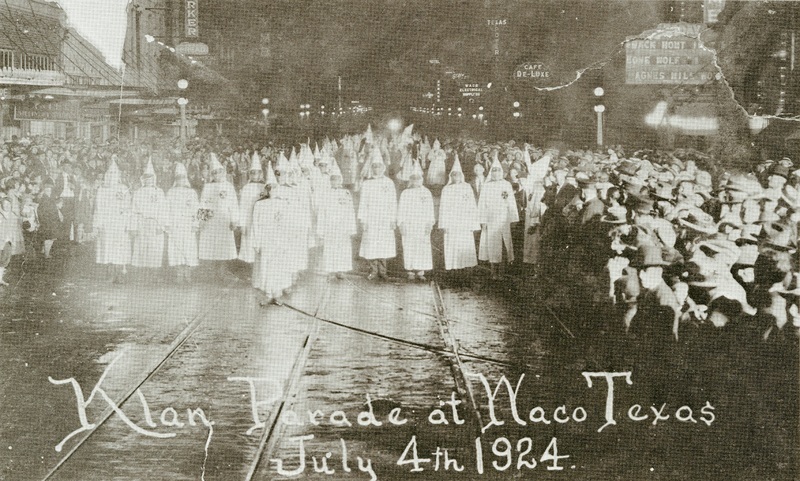 Robertson won the first Democratic primary, and the Waco Klan held a massive parade down Austin Avenue in celebration. But the Klan itself experienced problems as upper-class and lower-class members fought over the purpose of the organization, the former wanting more political control and the latter still focused on vigilantism and extralegal violence. Communities like Waco were also growing apprehensive about the rise in mob violence that accompanied the influx of lower-class individuals to the Klan. Robertson was unwilling to condemn Klan violence and assuage these fears, so he lost the primary runoff to Ferguson as a result. This proved to be the death knell for KKK dominance in Waco and the state at large. By 1927 the Waco Klan had sold all its property. The 1920s proved to be the first wave of KKK activity in Waco, but not the last. By the 1950s, Klan ideology was alive and well in Waco once more. Horace Sherman Miller joined the KKK after Brown vs Board of Education in 1954 and was a Texas Kleagle until 1957. That same year, he decided to start a mail-order chapter, the Aryan Knights of the KKK. 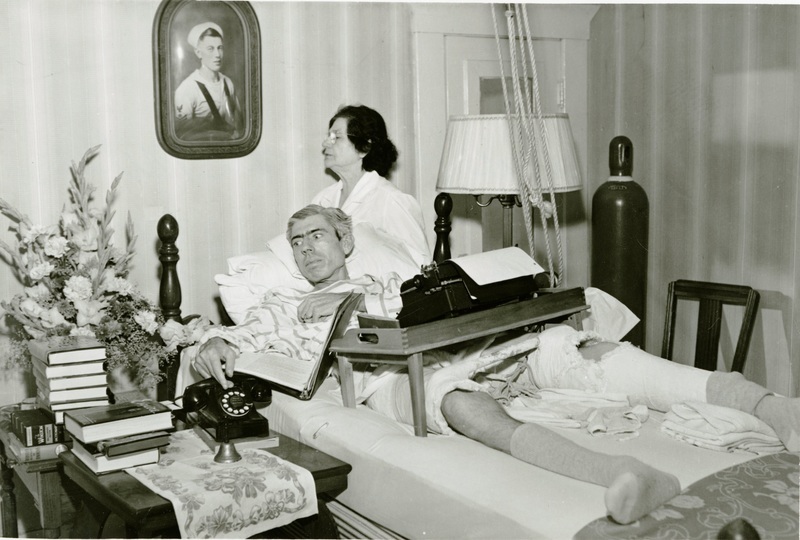 His home served as the headquarters, as tuberculosis had made him an invalid, and he wrote the newsletter with a typewriter set up over his bed. Though based in Waco, his newsletter had readership across the country as civil rights challenged the racial ideas of the nation. Miller’s newsletter enjoyed success until it ended with his death in 1964. The KKK would not come around again officially until the 1990s, though it is possible that the organization existed in some form underground. Dallas Klansmen came out into the public eye again in 1993 to criticize the FBI’s handling of the Branch Davidian siege. They traveled to Waco and claimed the Klan had a much more effective plan for extricating the Davidians, but they refused to elaborate on any extralegal measures. Further, the Texas Knights of the KKK, led by Michael Lowe, gained prominence in the mid-1990s and had a base in Waco. The KKK has a long and controversial history in Waco. But there have also always been Wacoans willing to fight back against the Klan and the prejudice it preaches. According to the Southern Poverty Law Center, the Traditional American Knights of the KKK have a headquarters in Waco today, but membership is extremely small and incidents very infrequent. Klan Parade: The reorganized Klan of 1915 followed the instructions of William Simmons, who wrote the “Kloran,” the official rulebook of the organization. 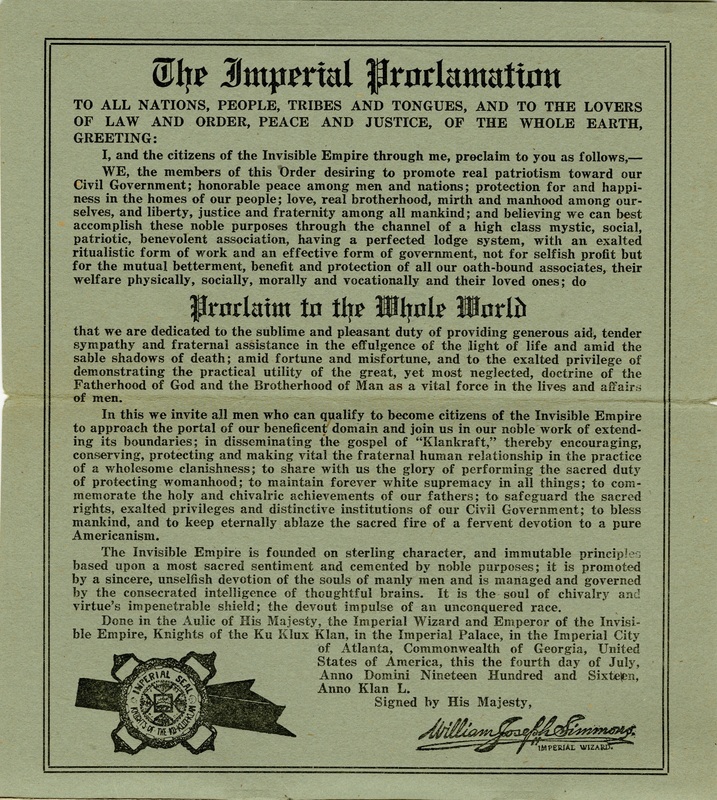 All Klansmen were part of the “Invisible Empire,” comprised of realms and provinces. Individual Klan chapters were referred to as Klaverns or Dens, led by a Klaniff, or president. ~ Source: Conger, Roger Norman., and Kari Vanhoozer. A Pictorial History of Waco: with a Reprint of Highlights of Waco History. Texian Press, 1998. 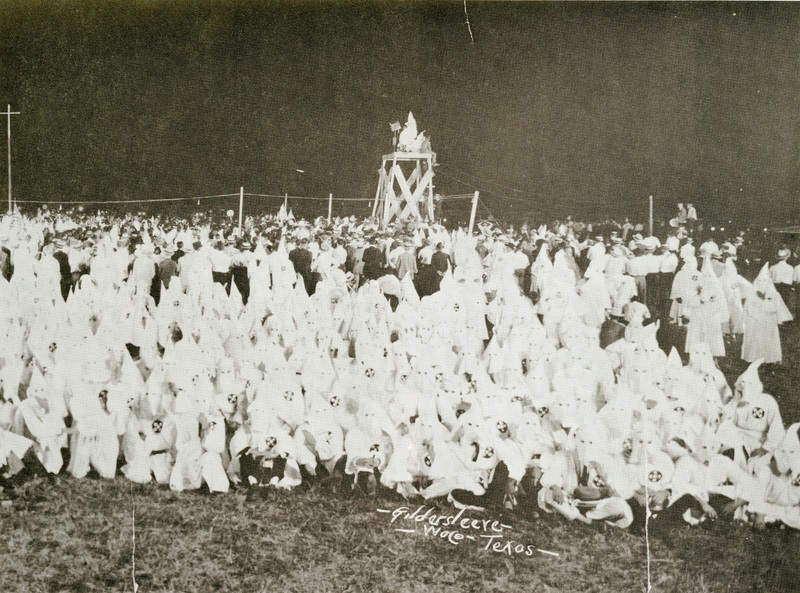 Klan Gathering: This image features a local Klan picnic for family and friends in 1923. Such an open and casual gathering illustrates the strength of the KKK and its acceptance in the Waco community. ~ Source: Conger, Roger Norman., and Kari Vanhoozer. A Pictorial History of Waco: with a Reprint of Highlights of Waco History. Texian Press, 1998. KKK Dollar: Though no records exist of the KKK in Waco in the 1860s, this KKK dollar comes from De Soto, eighty miles north of Waco. But Waco itself was undeniably immersed in a vigilante culture of lynching and mob violence. In fact, over fifty incidents of mob violence occurred in Waco between 1865 and 1900 alone. Many of these incidents involved whitecapping, defined as white-against-black crime, a term that originated from the white hoods of the KKK. A culture conducive to prejudice and racial violence already had a hold on the town. ~ Date: Currency Collection, Folder 13, The Texas Collection, Baylor University. KKK Information Pamphlet 1917: The KKK had five provinces in Texas in 1922, headquartered in Houston, San Antonio, Fort Worth, Dallas, and Waco. State membership stood at 75,000 to 90,000 Klansmen. ~ Source: KKK Collection, The Texas Collection, Baylor University. KKK Kreed: Though the Waco Klavern was not founded until 1921, witnesses of the Jesse Washington lynching in 1916 claim there were Klansmen involved. It is possible small unofficial Klan groupings existed before the official klavern was formed. ~ Source: KKK Collection, The Texas Collection, Baylor University. Imperial Proclamation: The terror of the KKK had a detrimental impact on Waco’s black community and caused many families to leave. The 1930 census showed that only 18.9 percent of McLennan County was black, down from 24 percent in 1900. ~ Source: KKK Collection, The Texas Collection, Baylor University. ABC's of the KKK: The KKK used a great deal of religious language. 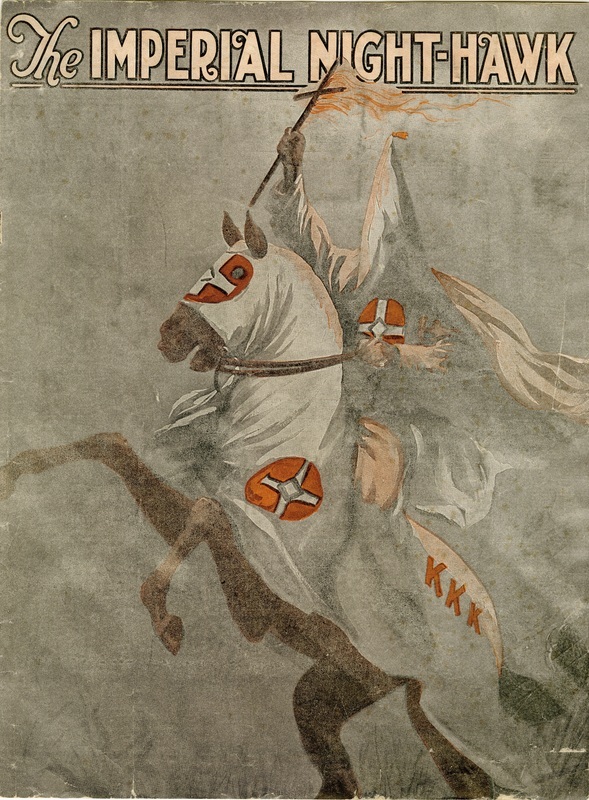 Klansmen saw the induction into the Klan’s Invisible Empire as symbolic of a Christian dedicating oneself to the Holy Spirit. They championed Romans 12:1: “I beseech you therefore, bretheren, by the mercies of God, that you present your bodies as a living sacrifice, holy and acceptable unto God, which is your reasonable service.” Klan induction featured many other scriptures as well as a baptism. 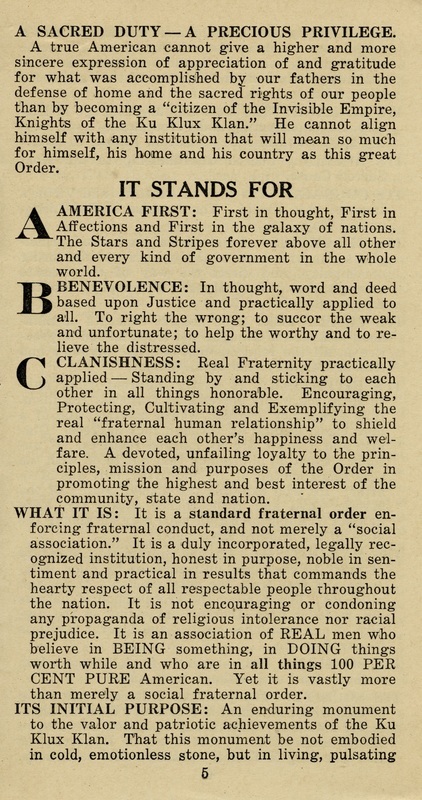 The duty of each member was “to worship God, be patriotic toward our county, be devoted and loyal to our klan and its officers and to practice klanishness toward his fellow klansmen.” They also pledged themselves to “worship the Lord thy God. Render unto the state the things which are the state’s. Love the brotherhood: honor the king. Bear ye one another’s burdens, and so fulfill the law of Christ.” ~ Source: KKK Collection, The Texas Collection, Baylor University. Membership Requirements : Requirements for Membership: Members had to be Caucasian, native born, and Protestant. The original goal of the “kleagles,” or recruiters, was to recruit upper-class Americans who could potentially influence politics. Once these men legitimized the local klaverns, membership was opened to middle- class individuals and later lower-class persons when the Klan wanted to boost its numbers and finances. The Klan provided a sense of superiority particularly for lower-class whites. ~ Source: KKK Collection, The Texas Collection, Baylor University. 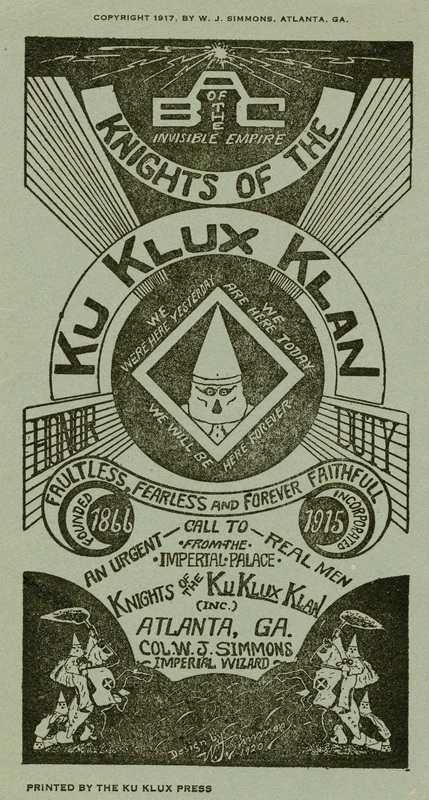 The Imperial Night-Hawk Magazine: The Imperial Night-Hawk was the KKK’s official national newsletter in the 1920s. 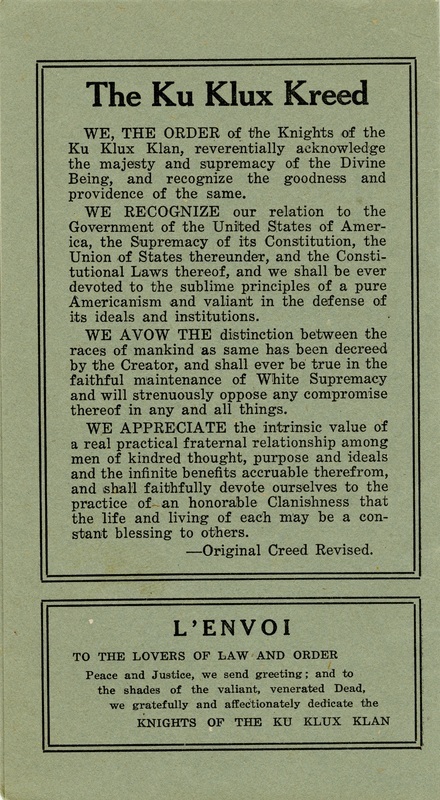 It was a weekly publication out of Atlanta, Georgia and included news about Klans nationwide. The May 9, 1923, edition reported that “Indiana is now running close to Texas as being the strongest Klan state in the Union.” Klan couriers were known as “Night-hawks.” ~ Source: KKK Collection, The Texas Collection, Baylor University. 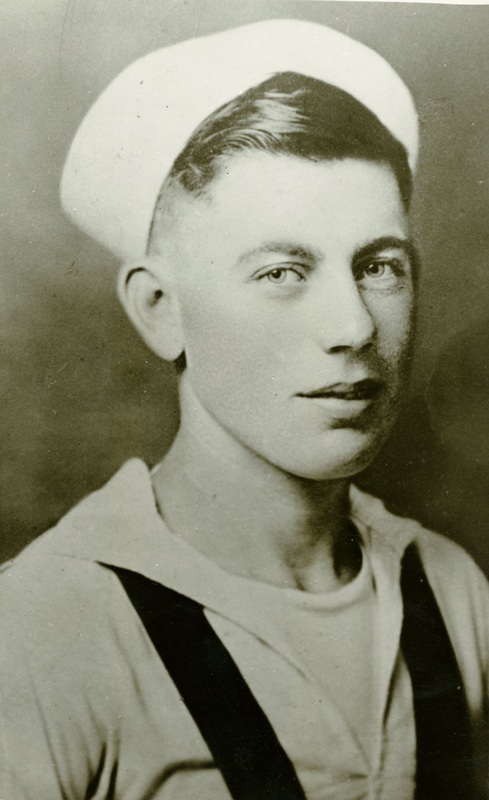 Young Horace Miller: Horace Sherman Miller, who started a Klan mail-order chapter, served in the navy during World War I and then later worked as a railroad yardmaster. He was diagnosed with tuberculosis in 1944, and the disease progressed to the point of making him an invalid. He lived with his mother and step-father from then on. ~ Source: Horace Sherman Miller Collection, The Texas Collection, Baylor University. 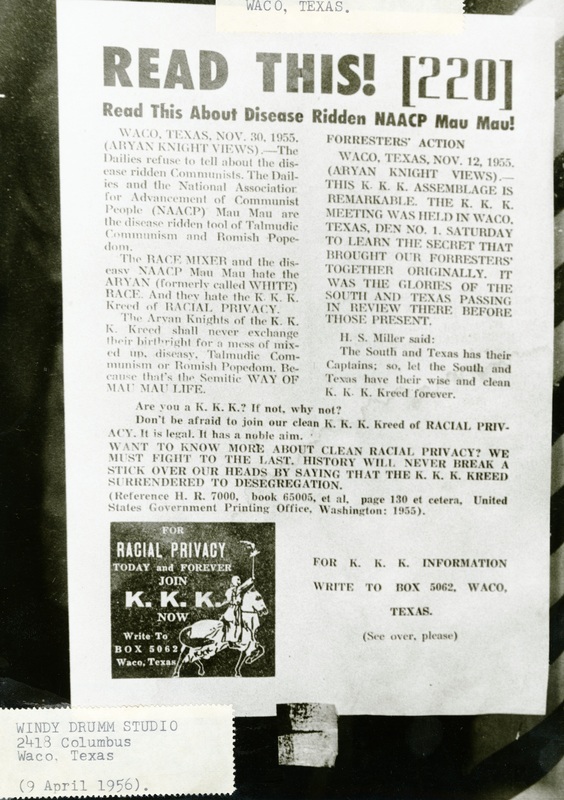 1956 KKK Recruitment Flyer: This recruitment flyer hung in a Waco shop window in the 1950s, showing the tangible KKK presence. Horace Miller is quoted on the flyer. ~ Source: Horace Sherman Miller Collection, The Texas Collection, Baylor University. Horace at Work: Horace penned his newsletter Aryan Views almost exclusively from his bed with the typewriter and small desk seen here. He was virulently anti-Semitic, anti-Catholic, and anti-black. His newsletter reached Britain, Mexico, Europe, South America, Australia, the Middle East, and South Africa. ~ Source: Horace Sherman Miller Collection, The Texas Collection, Baylor University. 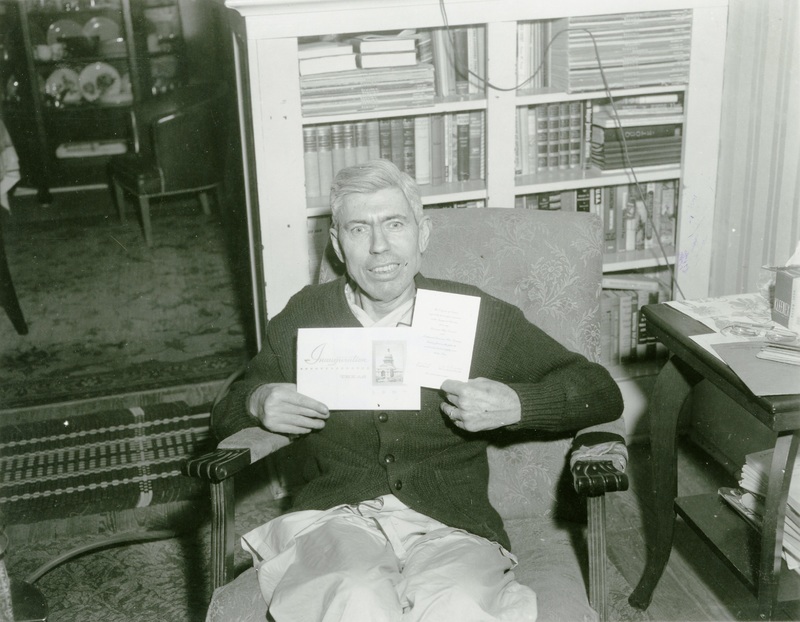 Horace Miller: According to The Handbook of Texas Online, “Miller gained notoriety in July 1957 when he sent a letter threatening a labor member of Parliament with a British version of Ku Klux Klan violence.” He may have been confined to his home physically, but his words impacted many around the world. ~ Source: Horace Sherman Miller Collection, The Texas Collection, Baylor University. 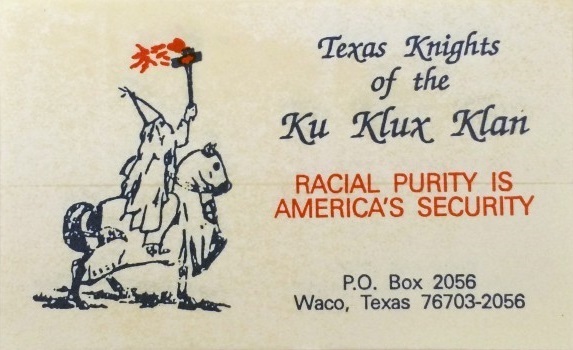 1990s KKK Sticker: This KKK sticker was included in a recruitment package sent by Michael Lowe in 1990, showing that Waco still had a KKK presence. Not much is known about the dealings of this recent Klan. ~ Source: Johnson, Daniel H. “Texas Knights of the Ku Klux Klan (Waco, TX).” The Hall-Hoag Collection, 19 Sept. 2014, blogs.brown.edu/hallhoag/2014/09/19/texas-knights-of-the-ku-klux-klan-waco-tx/. Anabel Burke, “The Ku Klux Klan in Waco,” Waco History, accessed April 26, 2019, https://wacohistory.org/items/show/200.